The future of nuclear power over the next few decades is murky everywhere. Today, nuclear power provides about 10 percent of the world’s electricity, down from its historical maximum of nearly 18 percent in 1996. In the U.S. and other industrialized countries, a looming question is whether, when the current nuclear power plants are retired, they will be replaced by other nuclear plants. In China and other industrializing countries, the central question is how much nuclear power will be built. Both a continuation of the current steady decline and an expansion driven by the developing world are conceivable. 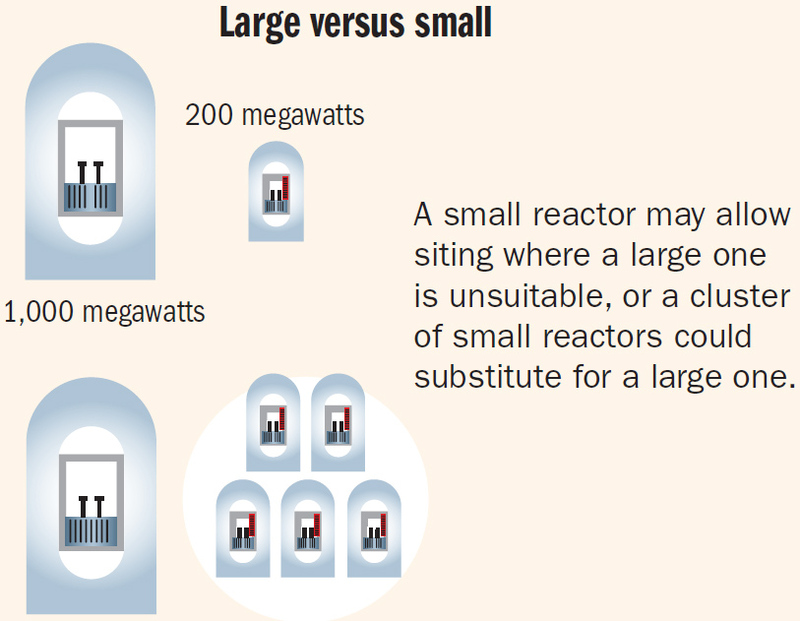 If nuclear power expands, there may be either a major or minor role for “small modular reactors.” A reactor is called “small” if its capacity is less than 300 megawatts, roughly three times smaller than the 1,000-megawatt reactors common today. Two quite different deployments are being considered: 1) in groups, where several small reactors are an alternative to one large one; and 2) individually, in remote, isolated locations where a large reactor is unsuitable. This report introduces small modular reactors to the non-expert. Family 1: Ready to Build. These reactors are small versions of the pressurized-water reactors that dominate the electricity market today. The fuel is the same, vendors of components already exist, and licensing should be less arduous. Performance and costs are relatively predictable. Family 2: Succeeding the Second Time Around. These reactors are based on past reactor designs that lost out in the 1970s to pressurized-water reactors that became the dominant technology. Two examples are pebble-bed reactors and molten-salt reactors. Both operate at a much higher temperature than pressurized-water reactors, raising the efficiency in converting fission heat to electricity and enabling certain non-electricity industrial applications. Family 3: Reducing the Burden of Nuclear Waste. The primary goal of several small modular reactor concepts is to destroy isotopes in spent nuclear fuel that would otherwise remain radioactive for thousands to millions of years, which might help with the siting and licensing of long-term geological storage. Geological storage complements shorter-term (many-decade) storage in dry casks at the nuclear reactor site. Family 4: Comes with Fuel for a Lifetime. A sealed nuclear “battery” reactor that does not require onsite refueling throughout its commercial life (perhaps 30 years) offers countries the option of acquiring nuclear power without the associated nuclear fuel infrastructure that induces linkages between nuclear power and nuclear weapons. A variant is a reactor that can be serviced without the involvement of the host nation, such as a reactor being constructed by Russia that would reside on a ship moored in a nation’s coastal waters. The severe accident in March 2011 involving several nuclear reactors at Fukushima Daiichi in Japan brought renewed attention to reactor safety. The radiation release resulted in the evacuation of towns, the deliberate destruction of contaminated crops and food, and abundant anxiety and distress. From a safety perspective, reactor smallness has advantages and disadvantages. When a pressurized-water reactor is small enough, safety can be enhanced by placing all the pipes carrying high-pressure water within a very strong vessel that is capable of withstanding high pressures: the French submarine reactors already do this. Moreover, with smallness comes less radioactive material available for release during an accident and less energy available in the reactor to disperse this material. On the other hand, from a systems perspective, interactions among multiple small modular reactors at a single site may allow an accident at one unit to spread to others. A major focus of reactor safety today is the emergency planning zone, acreage around a nuclear reactor where special rules apply. The emergency planning zone for most pressurized-water reactors in the U.S. extends about 10 miles. U.S. vendors of small modular reactors are seeking rulings from the Nuclear Regulatory Commission that shrink this distance, even to within the reactor site boundary. Uranium and plutonium link nuclear power and nuclear weapons. Uranium enrichment “at the front end of the fuel cycle” where the reactor fuel is produced, and plutonium separation “at the back end of the fuel cycle” where the fuel is disposed of, are more dangerous than the reactors themselves. To make uranium useful for most types of small modular reactors (and large reactors), the uranium must be “enriched” in the U-235 isotope (the rare nucleus of natural uranium) relative to its abundance in the Earth’s crust, where only seven uranium nuclei out of 1,000 are U-235, the rest being U-238. Today’s fuel for large commercial pressurized-water reactors has 3 percent to 5 percent U-235; above 20 percent U-235 is considered “highly enriched” uranium. The level of uranium enrichment in today’s weapons is greater than 90 percent. In the small modular reactors currently under discussion, the amount of enrichment of the uranium fuel ranges widely, but it is always below 20 percent (sometimes, just below). However, because any enrichment facility producing fuel for a reactor can be modified to produce fuel for a bomb, all enrichment is of concern. As for plutonium, it is created within the uranium fuel assemblies at all nuclear power plants and leaves the reactor as a component of highly radioactive spent fuel. If the spent fuel is chemically processed, the plutonium can be separated from all the other components and become available for use in nuclear weapons. Pressurized-water reactors do not need such separation. Nonetheless, some countries do separate plutonium from spent fuel anyway. The same might be done with pressurized-water small modular reactors as well. Other small modular reactors, including molten-salt reactors and some reactors designed to burn nuclear waste, require fuel processing to remove certain isotopes whose build-up in the reactor shuts down the nuclear chain reaction. There is no need to remove plutonium to sustain the chain reaction, but the same fuel processing facilities could be readily modified to do so. As the narrow arrows in the figure above suggest, even small diversions have military significance. At a site where a large nuclear plant is to be retired, replacing that plant with several small modular reactors competes with 1) building a new large nuclear plant, 2) using the site for non-nuclear power production or some other purpose, and 3) abandoning the site. Continuing the use of the site for nuclear power, whether in large or small units, postpones the need for “decommissioning,” which is expensive. A nuclear power plant typically runs nearly all the time and produces power at a constant rate. It is more straightforward to compare its cost with the cost of power from a natural gas power plant running most of the time than with the cost of intermittent renewable energy sources like sun and wind. With many simplifying assumptions, if a nuclear power plant’s capital cost is $5,000 per kilowatt, the breakeven gas price is 15 dollars per million Btu, a price seen not long ago in wholesale markets in Japan, although more recent prices there are lower. A $2,000 per kilowatt decrease in the capital cost of a nuclear power plant lowers the breakeven natural gas price by five dollars per million Btu. These breakeven results assume that there is no price on carbon dioxide emissions. A price on carbon dioxide makes electricity generation from natural gas more expensive: indeed, a price of $100 per metric ton of carbon dioxide is equivalent to raising the price of natural gas by five dollars per million Btu, relative to no carbon price. But a carbon price has only a small effect on the cost of nuclear power – a “small” but not a zero effect, because although nuclear fission produces no carbon dioxide, auxiliary emissions result from the use of fossil fuels in uranium mining, uranium enrichment, and reactor construction. Power from natural gas at five dollars per million Btu (higher than recent wholesale prices for natural gas in the U.S.) doesn’t lose the competition with nuclear power until the capital cost of the nuclear plant falls below $5,000 per kilowatt with a $200 per metric ton of carbon dioxide carbon price, or below $3,000 per kilowatt with a carbon price of $100 per metric ton of carbon dioxide. Two economic principles affect the competition between a single large reactor and a group of small reactors: “scale economies” and “economies of serial production.” As a result of scale economies, a 1,000-megawatt plant will generally cost less to build and to operate than five 200-megawatt power plants of similar design. On the other hand, small size could enable more extensive “modular” construction in a factory and less construction on site, which could bring unit costs down. If the number of small plants constructed becomes large enough, if “learning” is strong enough, and if the diseconomies of small scale are weak enough, five 200-megawatt reactors could become cheaper than one 1,000-megawatt plant. 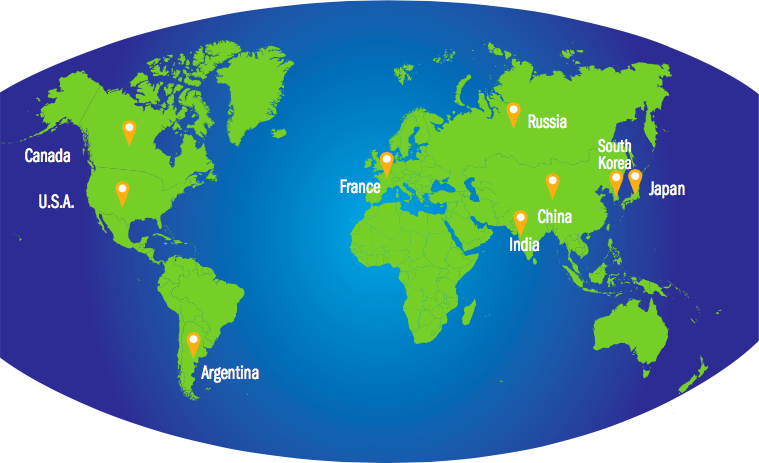 Many national governments are providing financial support for the development of small modular reactors. In 2012 and 2013, the U.S. Department of Energy awarded separate grants of up to $226 million to Babcock & Wilcox and NuScale, two would-be vendors of pressurized-water small modular reactors. China is constructing a 210-megawatt pebble-bed reactor. The International Atomic Energy Agency is encouraging small modular reactor development by coordinating the various national efforts. At present, climate policy and nuclear power policy are only loosely coordinated. Looking ahead, many economic models explore how policies responsive to climate change affect the global energy system over the next decades. Some models feature an increasing role for nuclear power, while others phase out nuclear power in favor of renewable energy, fossil fuel use without carbon dioxide emissions (“carbon dioxide capture and storage”), and energy demand reduction. Alexander Glaser is assistant professor at the Woodrow Wilson School of Public and International Affairs and the Department of Mechanical and Aerospace Engineering at Princeton University, where he directs the Nuclear Futures Laboratory. His research interests include nuclear disarmament and nonproliferation, nuclear transparency and verification, the nuclear fuel cycle, and nuclear energy. Glaser is the co-editor of the journal Science & Global Security and a co-chair of the International Panel on Fissile Materials, which publishes the Global Fissile Material Reports. Disclosed research funding, consulting, and board memberships in the energy sector over the past five years and current financial interests in the energy sector as of May 2015. M. V. Ramana obtained his Ph.D. in physics from Boston University in 1994 and joined Princeton’s Program on Science and Global Security (SGS) in 1998. Between 2004 and 2009, he was at the Centre for Interdisciplinary Studies in Environment and Development in Bangalore, India. He is currently appointed jointly with SGS and the Nuclear Futures Laboratory and works on the future of nuclear energy in the context of climate change and nuclear disarmament. Ramana is the author of The Power of Promise: Examining Nuclear Energy in India, Penguin Books, New Delhi (2012). He is a member of the International Panel on Fissile Materials and a recipient of the Leo Szilard Award from the American Physical Society. Ali Ahmad is a research fellow in Nuclear Technology Policy at Princeton University’s Woodrow Wilson School of Public and International Affairs. Ali’s work covers informing nuclear policy, assessment of new nuclear technologies and nuclear fuel cycle options, nuclear energy and climate change, and the introduction of nuclear power to new markets. A Physics graduate from The Lebanese University in Beirut, Ali holds a Ph.D. in nuclear engineering from Cambridge University. The contributors would like to acknowledge the helpful feedback from John Balkcom, Rob Goldston, Mark Holt, Thomas Kreutz, Granger Morgan, Robert Rosner, Mycle Schneider, Tatsujiro Suzuki, and Frank von Hippel.